The Boeing X-50 Dragonfly, formerly known as the Canard Rotor/Wing Demonstrator, was a gyrodyne unmanned aerial vehicle that was developed by Boeing and DARPA to demonstrate the principle that a helicopter's rotor could be stopped in flight and act as a fixed wing. The X-50A built upon the work of the Sikorsky S-72 X-Wing program of the 1980s by designing the vehicle as a multi-mode aircraft from the ground up. The X-50A was one of two projects funded by DARPA in its "Heliplane" program. Neither of the two prototype aircraft ever successfully transitioned to full forward flight. DARPA withdrew funding for the X-50 program in late 2006 due to inherent design flaws. The X-50A was a joint program between Boeing and DARPA, with each paying for half the development costs. The X-50A was powered by a single conventional turbofan engine. For rotary-wing mode, the engine's exhaust was diverted to nozzles in the tips of the rotor blades. When the aircraft transitioned to full forward flight, the engine exhaust was directed through a nozzle at the rear of the aircraft and the rotor was locked into a fixed position and functioned as a conventional wing. Two proof-of-concept aircraft were built as part of the program. 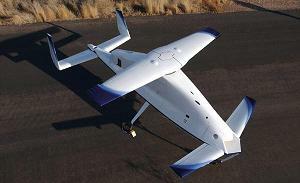 The X-50A's maiden flight took place on 24 November 2003. During the third flight of the prototype X-50A, on 23 March 2004, the vehicle crashed, as a result of cross-coupling in the controls. A second, improved prototype ("Ship 2") was then built. On its sixth of 11 planned test flights, Ship 2 was completely destroyed in a crash at the Yuma Proving Grounds on April 12, 2006. Subsequent investigation revealed that the aircraft's fuselage was subject to an aerodynamic pitching moment of extreme sensitivity. Both airspeed and rotor wake would produce a nose-up pitching motion that was greater than the flight controls could compensate for. Neither aircraft was able to achieve transition to full forward flight mode during the portions of the test flight program that were completed. In September, 2006, DARPA recognized the inherent design flaws and withdrew funding for the program.